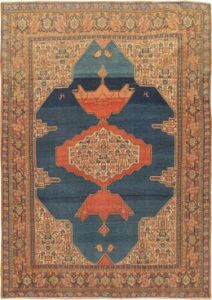 From the town of Senha (Sanandaj) in Kurdistan come antique rugs that attain nearly miraculous fineness and suppleness. And they are rugs, almost never room sizes or runners. The texture is unique: a sandpapery back and an incredibly low pile. Antique Persian Senneh rugs are among the most collectible and coveted of Iranian town rugs. The production has always been small and those with silk warps are incredibly rare. The same Kurds who make the most rustic and folky rugs in Persia also weave these amazing pieces of true rug art. Modern Senneh’s are good, but the 19th century antiques are truly magical.